let's get personal | stesha rose. romper: LA boutique // shoes: TOMS // watch: MK // jewels: Tiffany & Co. Happy Tuesday my Blogging Beauties (BB... for now I am going to address you all as my BB's) I am here to get a littler personal with you today. Not the emotional side of SJ but personal as in physical side. Okay warning, this is kinda gross but I feel I have to share & I am going to be looking for feedback from you all as well. On January 20th I ran the P.F. Changs Rock n Roll half marathon. This was my second half so I knew what to expect. I have heard horror stories from runners who have lost their toe nails from running.... ewww loosing toe nails sounds sick! Well guess what happened?! Yepp, I ran the half & the next day I couldn't figure out why my big toes were so sore. I refused to take my nail polish off to look at them for weeks, but once I did my fear came to real life, I was looking at 2 very black big toe nails. saddddd & grosssss! I have been waiting patiently to see what would happen with each nail until last week when one fell off. Yuck! Now I have a nub for a toe. What do I do?! It is seriously so gross, a big toe with no nail?! And to make it worse I am still waiting for the other nail to fall off. My question to you is: 1st has this ever happened to any of you? 2nd: I know I can't wear shoes all summer, 110 degrees in AZ = flip flops not shoes, so what do I do? Help meeeee!! On a fashion note, I have this beautiful T-strap top on pre-sale today!! 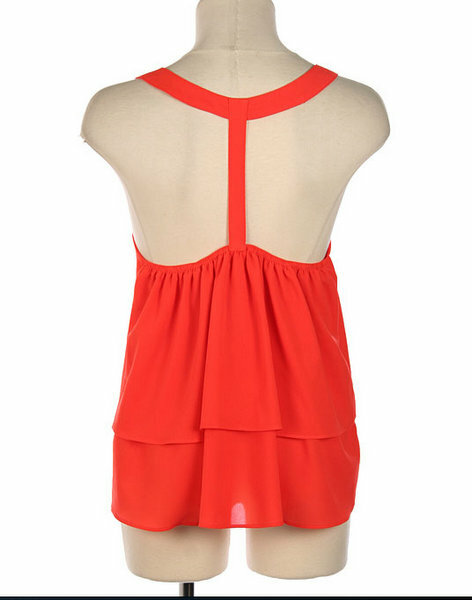 I am obsessed with this coral color & the back adds just the perfect amount of flare. Email me if you have to have it, I can't wait to wear it myself!!! $32 - they will sell fast so email like now!! I am going to place another order for the Chevron Dress from yesterday so if you are still wanting it let me know!!! Can't wait for you all to see the grand opening next week!!!! ah that sounds like it hurts! terrible. no idea what to do. love the jumper though! I have lost a few toe nails in my life. I tend to somehow drop things right on the nail base. And the nail usually falls off. Not I make ur am situation worse, but sometimes the nail is gross that grows in, it will become more normal after growing out! Feel better! This has happened to me! I didn't lose my big toe nail, but one of my smaller toe nails. I decided I would just paint my toenails and paint my skin where the nail was missing. It worked pretty well! I've lost my toe nail many times due to dance. It's SO painful, and really gross. I would always put a bandaid over it. Ouch!! I slammed my finger in my car door this winter and lost part of the nail. NOT FUN. I guess maybe bandage it? Hi Stesha, My toe nail has fallen off and it will grow back. Use tea tree oil to keep the area from getting infected and wear flip flops. The toe nail should grow back. Good luck. Love your jumper by the way. Oooh, I have an almost identical romper from H&M 2 summers ago. I totally forgot about it! Now, I'm super excited for warmer weather to hit up here! (It'll be at least another month or two before I can break out anything summery. Le sigh.) Love the look! My friend lost her big toenail once and she would just paint her skin as if the nail was there. Honestly you couldn't tell, and if someone does notice they are looking too close at your feet. I hate running, so can't give you any advice in your toe, but I hope it gets better soon! Love that romper. Hey girlfriend!! I tried to respond to your comment, but your email isn't connected to your blog...just wanted to let you know!! I lost a toenail last year from running and just kept painting over the nub of it cause it's just so hideous! It has finally grown back 11 months later. Love, love love that romper! Such a fun summer piece! I need one stat! I wish I had advice. I have no idea what you're suppose to do :( I hope you're able to get some good advice.